Helen Walbey is managing director of Recycle Scooters in Aberdare, South Wales, and in December 2015 she was appointed as the Federation of Small Business’s UK Policy Portfolio Chair for Diversity and Health. 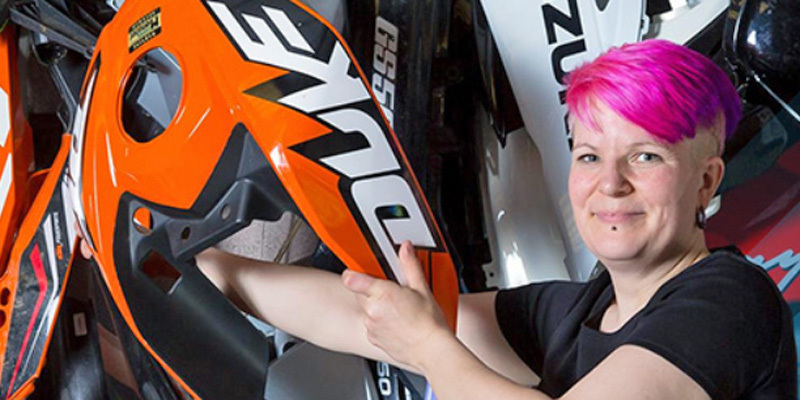 Helen has run her own business since 2004, when she started trading bike parts online as a way to make ends meet after her husband had been seriously injured in an accident at work. 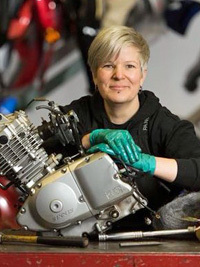 Today her company trades parts internationally, and has a number of major contracts for motorcycle dismantling. I never planned to go into business but, after moving from the North of England to Wales to help my husband care for his in-laws, we ended up running a pub and then starting our own vegetarian and organic catering business. My husband was injured in work and caught an infection which nearly killed him. Thanks to five lots of surgery and some incredible NHS care, he is alive and well, and still has both his hands. I chose to stay at the hospital and not go to work, so our catering business ended up failing, leaving us with a large debt and the risk of our house getting repossessed. From those ashes I borrowed £750 from family and started Recycle Scooters from our house. We have steadily grown the business and repaid the debt. We now have two industrial units and a team of five staff. I deal with all the strategic and management function of the business but I can still turn a spanner in the workshop and I am not too proud to clean the loo and take out the rubbish. I enjoy using social media for the business so we can engage with customers and promote what we do. I normally get into work for 9am and we shut the doors at 5pm, but all the accounts and admin get done in the evenings or on a Saturday. No two days are the same – that is both the challenge and the buzz. The Federation of Small Businesses is the largest business membership organisation in the country and we lobby Government on behalf of the 5.4 million small business owners and self-employed, as well as providing a great range of member benefits. My role is the lobby for effective policy, to lead our UK Women in Enterprise taskforce and LGBT+ working group, as well as to undertake research across the UK about what small businesses, and especially women, need and want. We collaborate with other organisations and frequently provide speakers to the media to share their expertise and experience of being a woman in business. Small businesses make up 99% of the businesses in the UK and provide 60% of private sector employment, so they are really the backbone of the economy and often the glue that holds local communities together. We know that businesses made up of diverse teams perform better than when everyone is the same. They can reach a broader customer base and have a wider appeal. Small businesses need to be able to move quickly. Having diverse thinking and ideas in your business will allow you to grasp opportunities and try new avenues quicker. I have actually been told by a scrap yard foreman: “You, little girl, need to go and get a proper job as no one will take your seriously in this industry.” I was able to happily inform him that “managing director” was a proper job and I was going to be just fine. Thirteen years down the line, I am technically adept, experienced and quite capable of holding my own in any environment. Over the years I have developed a very thick skin and a good sense of humour but I will always call out bad behaviour and challenge anyone, male or female, who is being sexist, racist, homophobic or discriminating against those with any type of disability. There is simply no need for it and no excuse for it. I have a business that I love and a great team. I get paid to play and what could be better than that? Why have a job you hate when you can have a business that you love? To start with it was very, very hard, but each day I learn a little more, I grow a little more and I am supported by some incredible people. Overcoming obstacles is much easier when you are not alone. My advice to women in male dominated sectors is not to make allowances for bad behaviour. Find make allies and champions to help educate other men, and just be good at your job. Put down ladders for the next generation and support other women in business – it is hard enough as it is, so try and make it a little bit better for others each and every day. If you can get a media profile then develop one as we need more diverse voices in the media and we need more women showing what they are capable of in business. Try and find or good mentor and become one for other people and stand up and be proud of what you do and feel good about celebrating your successes along the way. We are looking at taking on a new member of staff in 2018, we will keep growing and we will keep championing the message that business is better when it includes everyone. Each day we have an opportunity to learn something new so each day we will take that and keep developing and keep growing.